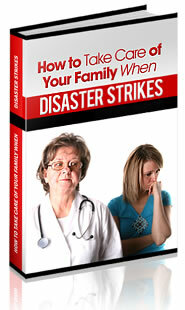 Earthquakes, Tornados, Floods, Terrorist Attacks – Are You Prepared? When we think emergency, we generally think that an emergency room would be the place to go to get help. But for those of us with no or minimal injuries, having a good disaster preparedness plan and a plan is the best answer to maintaining health and safety until further assistance arrives. Here are some things to have on hand. A good first-aid kit … not just one with band-aids and alcohol wipes. You will need band-aids of different sizes, gauze squares and wrap, paper and plastic tape, bottled antiseptic, scissors, anti-biotic ointment, alcohol wipes, bug-bite spray, disposable gloves (a box of them), a bottle of saline to use for eye wash, 2 packs of 81 mg aspirin (for those who may experience stress-related heart problems), Ibuprofen or Tylenol (remember to limit the amount of Tylenol taken to 200 mg per day), elastic bandage roll (the kind used for sprains), a breathing barrier with a one-way valve, some surgical masks, instant cold packs, steri-strips, tweezers for slivers and a first aid instruction booklet. A battery powered radio and flashlight. Be sure to keep extra batteries in your kit, as well – AAAs. AAs, Cs and do not forget the Ds for the larger flashlights and radios. Extra pair of glasses, if available. Do not forget the reading glasses. Hearing aid batteries – these are a must if you have a hard-of-hearing loved one. List of prescribed medicines and allergies for each person in the family. Extra bottles of prescriptions, if obtainable. Water – non-potable. If you are on a well or living off the grid, you will want to keep extra gallons of water for flushing toilets, etc. $ bills and other change. There will not be many people who can change a $ 20 and you can barter for items much better if you have the proper change. other non-perishable items as desired – try to get foods with at least a 6 month shelf life. A large trash can is a great place to store your preparedness kit. Keep the foods on top so that you can check their expiration dates. This does seem like a very long list but gathering and having these items available to you in case of an emergency will allow you to be prepared for many natural disasters.